If you're ever in Parkers Prairie, a town of about 1,000 in the far southeast corner of Otter Tail County, you'll want to do two things. One is to stop by the Prairie Perks coffeehouse and check to see if they're serving their chicken-wild rice soup. It's that good. The other is to go across the street to the city hall and chat with Dave Campbell, the city administrator. If you're lucky, he'll take you on a tour of the town. There's plenty new to see. Our tour began with a look inside the nearly completed Prairie Event Center--scheduled to open Sept. 1. This multi-purpose building will serve as the town's community center. Its main space is big enough for 600 people. The center also has a stage, a commercial kitchen and a good-sized meeting room. Many activities are already booked, including weekly meetings of service organizations and senior dining. The local food shelf also will be housed in the building. On the south edge of town, earth movers ready the ground for a new housing development. Nearby, Urbank Machine is in high gear. The business started out in a double garage in the neighboring town of Urbank. Three employees worked on three machines. 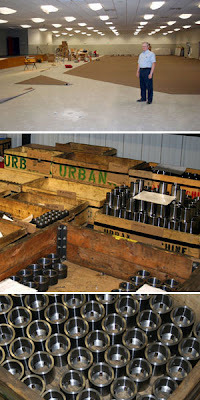 Today, the manufacturer employs 25 workers and has more than 40 machines for lathe work, laser etching and more. Over at AbbeyMoor Medical on the east side of town, it's been an exciting 12 months. Its product, the SpannerTM Prostatic Stent, a device used to manage urological disorders in men, received FDA approval back in December. They just received a positive coverage decision from one of the Medicare carriers. With a successful clinical trial and a lot of good coverage in medical journals, AbbeyMoor is poised to take off. For both Urbank Machine and AbbeyMoor, West Central Initiative has been a financial partner in their growth. Downtown, the building that used to house the city hall and the municipal liquor store is getting a facelift. The Prairie Perks just opened there a couple months ago. Whether you order the soup or a cappuccino, it's a good spot to check your email on your laptop by accessing the Perks' wireless internet connection. Folks are pretty excited about the pizza parlor opening in the same building. They can already order the pizza at Sammy's c-store, which is made with the owners' own special recipe--but they're looking forward to a sit-down option to take-out. Just down the street at The Parkers Prairie Independent the presses are running like they have been for 105 years. The Myers family hasn't owned the paper for all of those years--only 98 of them. Tom Myers is third generation. His daughter makes it generation number four. If this blog entry piques your interest about Parkers Prairie, this weekend is a good time to visit. The town will be celebrating its annual fall festival, Aug. 3-5.